The ship Balao docked at Verbrugge Terminals in Vlissingen, in North Sea Port, carrying a cargo of fruit. This was the first ship to arrive as part of this logistical service provider's first permanent intercontinental shipping line. For Verbrugge, this is the first intercontinental shipping line to be handled at this port. 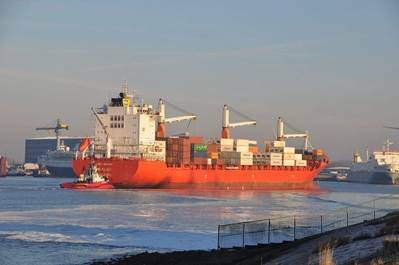 Each week, ships from the shipping companies Streamlines and Hapag-Lloyd will sail from South America to Vlissingen in North Sea Port. The fruit will be transported in refrigerated containers. The Balao is 208 metres long and can accommodate over 500 refrigerated containers on board. In Vlissingen, some 100 containers with 2.5 million kilos of fruit and fruit juice will be discharged at and by Verbrugge. After that, Zoomweg Zeeland Coldstore – which has the necessary refrigerated and frozen storage facilities – will take over further handling of the fruit. As a ‘food port’, North Sea Port is investing heavily in the transshipment of cargoes such as fruit. Thanks to this new permanent shipping line, Verbrugge is establishing itself even more firmly in the North Sea Port area. Verbrugge Terminals claimed that the shipping companies chose the Verbrugge terminal due to its location near deep shipping channels and the length of its quays.